Two sisters who wandered away from home and got lost in woodland for two days have been found safe and well. Leia Carrico, eight, and Caroline, five, from North California, spent 44 hours in a cold and rainy forest. The girls were found huddled under a bush, having survived drinking water from huckleberry leaves and eating cereal bars they had brought with them. They were “in good spirits”, Humboldt Country Sheriff William Honsal said, adding their discovery was a “miracle”. 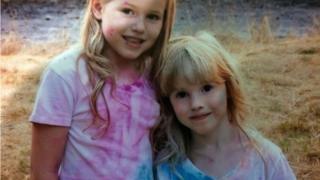 The girls’ mother, Misty Carrico, alerted authorities when she noticed her daughters were missing on Friday afternoon. The sisters had asked her if they could go for a walk around their home in Benbow, near the Eel River, but she had declined. After noticing her daughters were missing, Ms Carrico went looking for them with neighbours and friends, before calling the sheriff. Dozens of police and rescue officials, using helicopters and dogs, were involved in the search. The girls told rescuers that they had got lost following a deer trail and made the decision to stay put. Sheriff Honsal added that the girls had received some wilderness training from their youth club, 4-H, which may have helped them survive.